He's adorable and he needs help fast, the shelter is Filling up. Please SHARE this baby so he can find a great home. A young 3-month-old Pug dumped at a shelter is struggling to come to grips with a new life, that is as confusing, as it is sad. SHASHE is trying his hardest to have faith in a system, that has seen so many like him executed, through no fault of their own. 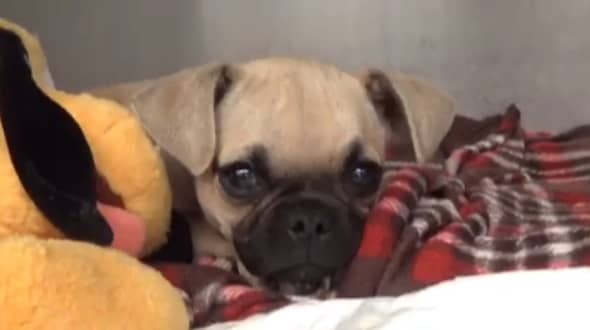 #A5176543 My name is SHASHE and I'm an approximately 3 month old male Pug. I am not yet neutered. I have been at the Carson Animal Care Center since 5/8. I will be available on 5/8. You can visit me at my temporary home at C403. My former family who owned me for about 3 months had to give me up because their landlord wouldn't allow me. Fidonation, if you or someone you know is interested in giving this pup the forever family he rightfully deserves, please contact the Carson Shelter - 310-523-9566, and reference the shelter ID #A5176543. 2 Responses to "3-month-old surrendered to kill shelter, Shashe clings to his favorite toy to sleeps away his pain"